Mr. Zierhut. We are in the year 2030. What does a good warehouse look like? Tobias Zierhut: It’s tidy, adaptable, and has a structured and controlled flow of goods. Does this mean that warehouses are currently untidy and unadaptable? T.Z. : Yes, many warehouses still fit this description. However, we have to distinguish between warehouses on the basis of size. 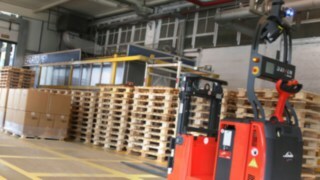 In general the larger a warehouse, the better it is usually structured. In the future, there will be much more automation in larger warehouses. This will make storage and retrieval considerably quicker. By that, I mean that there will be quicker movements of goods, shorter distances and more flexible decisions regarding where certain goods are stored because these decisions will be data-driven. Companies such as Amazon are good examples of this. 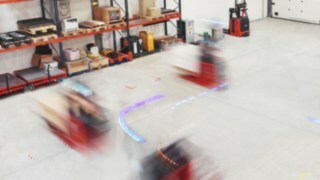 Even today they know exactly when and how quickly goods will be handled and can optimize their warehouse operations accordingly. How can companies benefit from this automation? It depends on the company. Every company that has a constant movement of goods will have to consider automation in order to reduce errors and make the process more efficient. 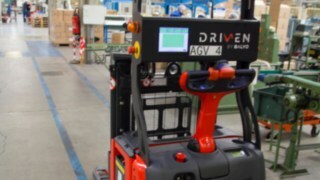 In companies where only a few hours each day are dedicated to order picking, it won’t be robots but intelligent trucks and additional assistance systems which help employees with their daily work. What are the current technical difficulties associated with automation? Automation of trucks is no longer a problem. The challenge is the speed of the systems. Automated trucks currently travel at walking speed. With drivers, they can travel twice as fast. However, it is not the maximum speed which is important, rather the highest possible average speed of the entire system. There is also the issue of order picking itself, in other words the actual manual work. Technology is not yet capable of performing these tasks. However, if you look at ongoing research projects, such as the one at the Institute for Technology in Karlsruhe, you will already see robots that can load and unload a dishwasher or fetch milk from the fridge. Admittedly it takes them much longer than it takes us, but it is the technical feasibility which matters. Speeding up these processes is then just a matter of time. So we won't have to wait until 2030. In the next five years we will see robots which can retrieve goods from warehouses on their own, stack them on a pallet, take these goods to an HGV in an autonomous truck and then load them. That is tomorrow’s world. What do I have to do as a user if I want to take this step into the future? Do I have to start from scratch or can I just upgrade my current infrastructure and existing trucks? It would not be possible to simply upgrade. You would need new processes and hardware. For example, if you want to automate a warehouse, you would need standardized carriers, in other words pallets. For a large warehouse with 100,000 pallets, this would be an investment project. Therefore we also advise our customers that they should automate their warehouses smartly. This means that they should pinpoint exactly where the greatest potential is and then start with a prototype. What we have spoken about so far mainly relates to larger warehouses. What would the entire system be like in the future and what role does intralogistics play? Logistics of the future will be determined by the last mile, in other words the last step to the customer. The key phrase here is “Delivery within one hour”, especially in urban areas. To make this possible, we need intelligent algorithms which will enable us to use big data analytics to predict who will order which t-shirt when and where. This helps to make the process more efficient. At present, we have return rates of up to 60 percent in e-commerce. And we know that customers who have to wait a week for a t-shirt are twice as likely to return it as customers who receive the t-shirt within 24 hours. As intralogistics specialists, we have to tap into this data pool. This will enable us to play a central role as the backbone of the entire system. 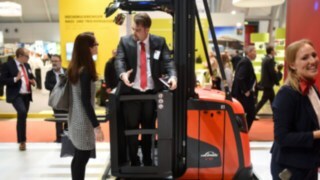 Obviously, intralogistics also extends far beyond warehouse technology. Production-related movements of goods will also play a major role. You mentioned the importance of data. However, this is where IT firms have an advantage. When will a start-up like Uber come along and take business away from Linde? One thing is certain. We can’t afford to wait until another company comes along. We will develop the business ourselves. However, in doing so, we must not forget that the basis for this is still material handling. It is crucial that we have a strong distribution and service network because our customers want more than just a great piece of software; they want to be sure that their logistics operations will work. I see plenty of opportunities for us in predictive maintenance. If I can use the data from the truck to manage my service technicians so that the customer almost doesn’t even notice that a truck is being serviced, I know I’m doing my job well. The second important area is automation. Here we look very closely at who we can collaborate with. The best example is our collaboration with Balyo. They had a brilliant idea, but lacked access to the market. And we as a company are not able to develop everything ourselves. Strategic partnerships such as this are productive and are necessary to take us forward. We are currently the market leaders in robotics. We have the largest product portfolio and the most advanced technology. This is reflected in our many ongoing projects. 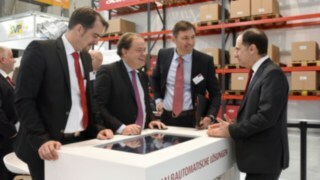 How will Linde’s role change in the future? Our aim is to use our core competencies in material handling to become the systems integrator for internal material flow. As an interface to the customer, we are the first point of contact and with our product and innovation portfolio, we can provide modern and efficient solutions.